The 2019 Sweet Life Planner is NOW AVAILABLE! 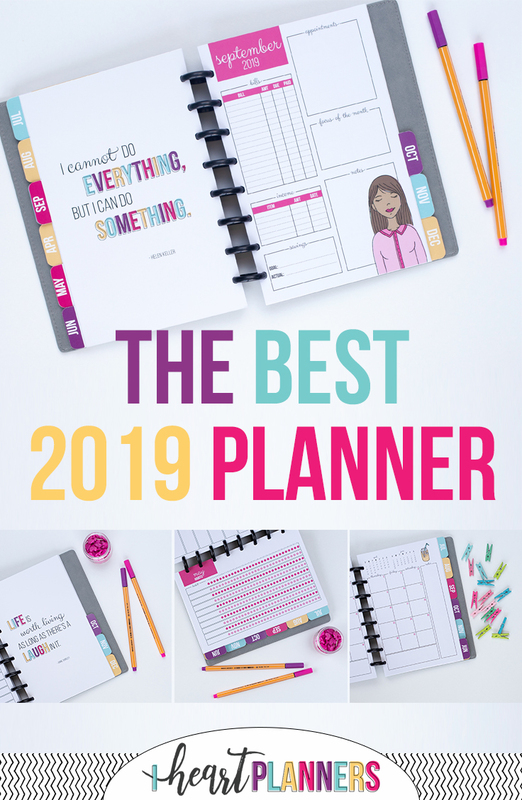 If you haven’t heard our big news yet…drum roll please…..the new 2019 Sweet Life Planners are now available for pre-order!! We have worked so hard to bring you the best planner possible for next year. We listened to your feedback and added countless new and improved daily planner pages and weekly planner pages to the new Sweet Life Planner! I just know you are going to love it! 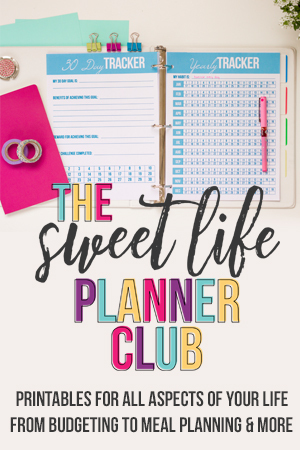 If you are anything like me, you are probably dying to get a first peek at the 2019 Sweet Life Planner! I thought the best way to show you what we’ve been secretly working on for months is to give you ten reasons (probably a few more than ten, because what is there not to love?) 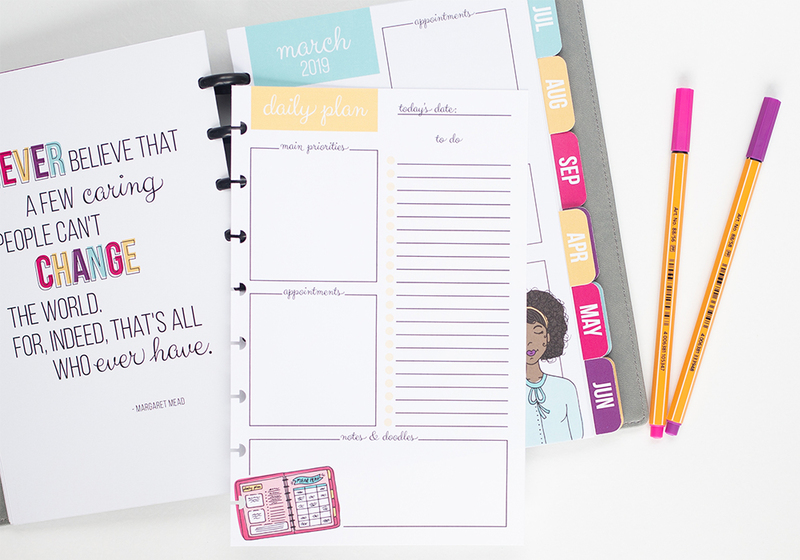 why we love the new 2019 Sweet Life Planner! #1 – NEW LEATHER TEXTURE COVERS IN 2 COLORS! There are hardly enough exclamation points for this one. This year we have new high-quality covers with a leather texture. Oh, and we even have two beautiful color options – grey and berry. They look very professional and chic for the most stylish planner girl. #2 – A DAILY AND A WEEKLY OPTION! That’s right -you can pick from two options! You can either choose a page per day or a weekly spread on 2 pages – whichever fits your needs. This was among our most requested options last year and we’re thrilled to deliver. Both options included the same core planner pages, so you’re not missing anything. 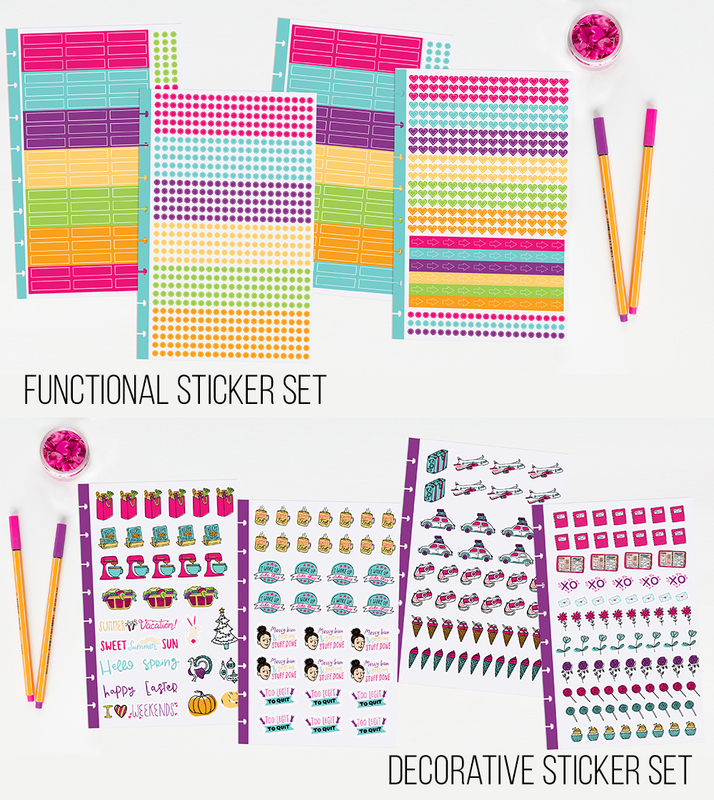 Not only does every planner come with two sticker sheets, but we have two more sets of stickers available in our shop. 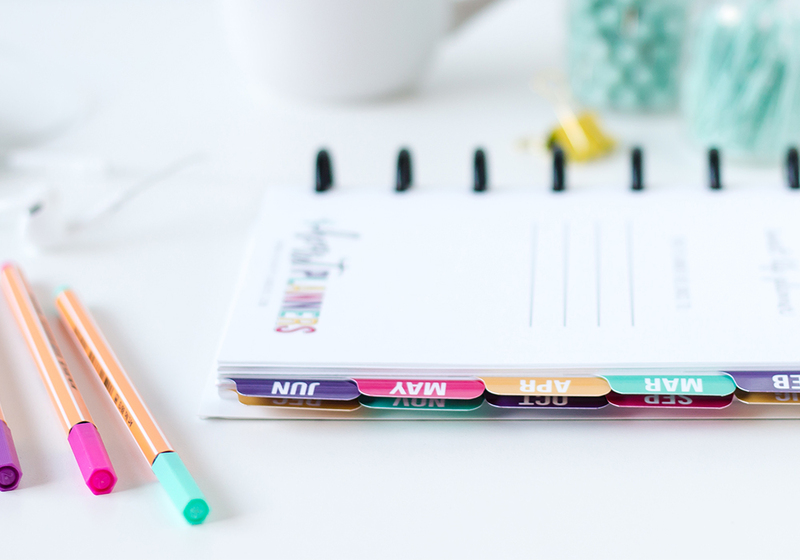 The functional set (which totally makes my color coding heart go pitter patter) and the decorative set (cutest sticker set EVER) will make your planner stand out. #5 – A ZIPPER POUCH! 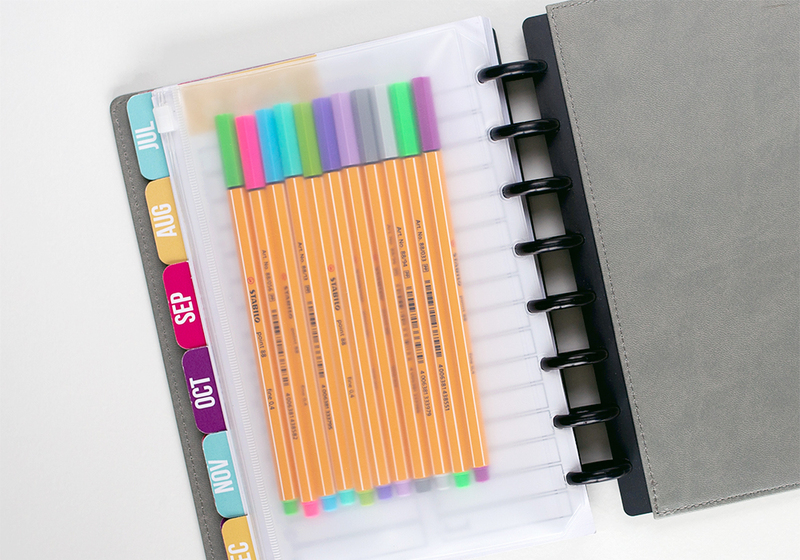 Every planner comes with a zipper pouch to hold loose papers, sticky notes, receipts, pens, and more. Plus you can purchase extra pouches if you need more storage space! #6 – EXTRA TAB DIVIDERS! 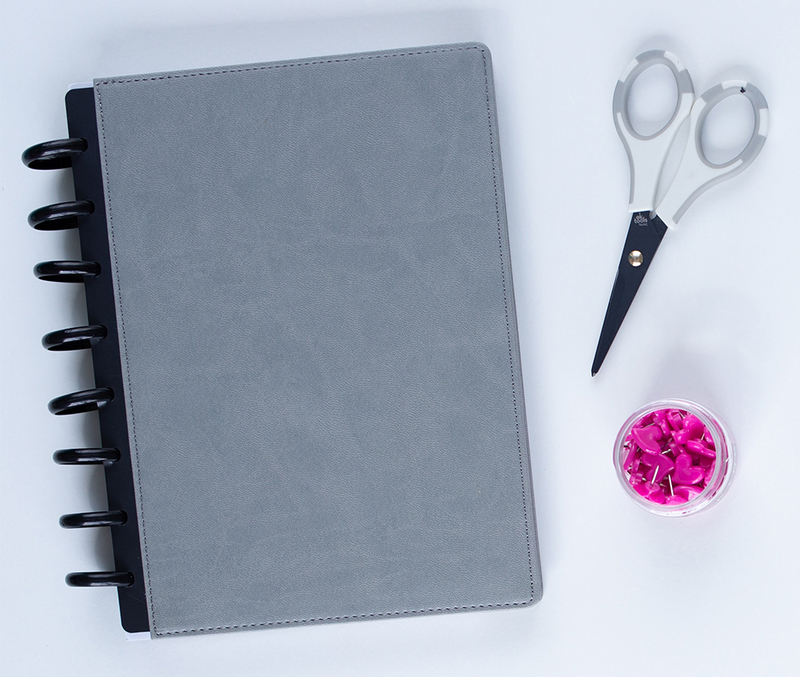 One of our most requested add-ons were extra blank dividers tabs so you can put all sorts of other things in your planner. I have a section for meal plans, master lists, passwords, and notes. 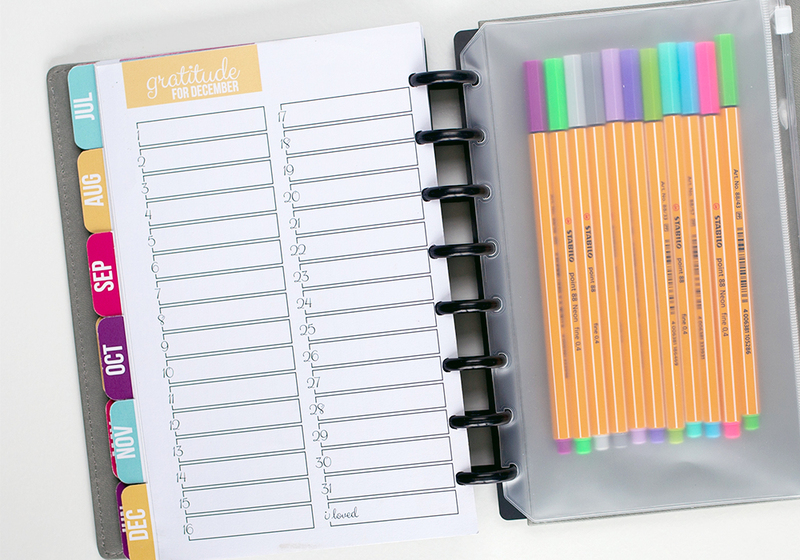 Now you can buy a set of 6 extra dividers to add to your planner to help you stay even more organized. #7 – FRESH NEW DESIGNS! Every single page of our planner got a facelift! We thoughtfully designed every little detail so it would coordinate and function beautifully. Plus all the daily pages have fresh, new illustrations and the monthly dividers have brand new quotes. We want your planner to be just right for YOU. 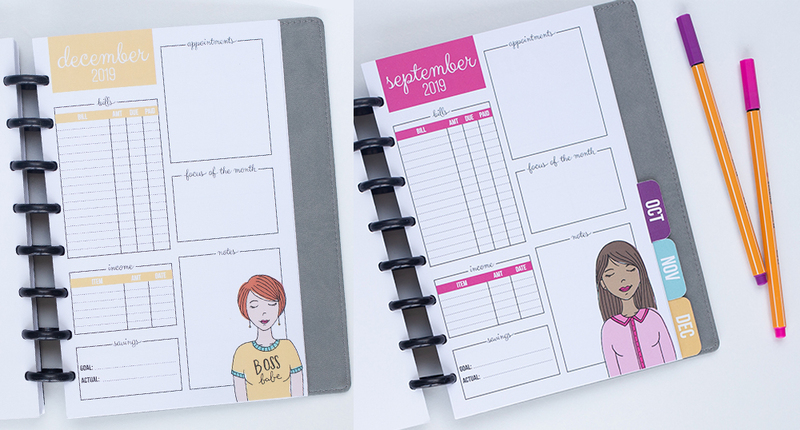 So you’ll find a diverse variety of planner girl illustrations throughout our pages. We released monthly overview pages as a printable in our club some time ago and you all went wild over them (for good reason). So we’ve put them in the planner – one for each month. We also added a monthly gratitude page. Yes, you read that right. No more cramming your weekend onto one page if you don’t want to. Every single day gets its own page. This means that our daily planner contains OVER 480 FULL-COLOR PAGES. Yes, you read that right – over 480 pages. All for just $55! (or just $45 if you preorder now). I’ve never seen any planner on the market that offers a true page per day for an entire year. And, don’t worry, all those pages won’t make your planner bulky. 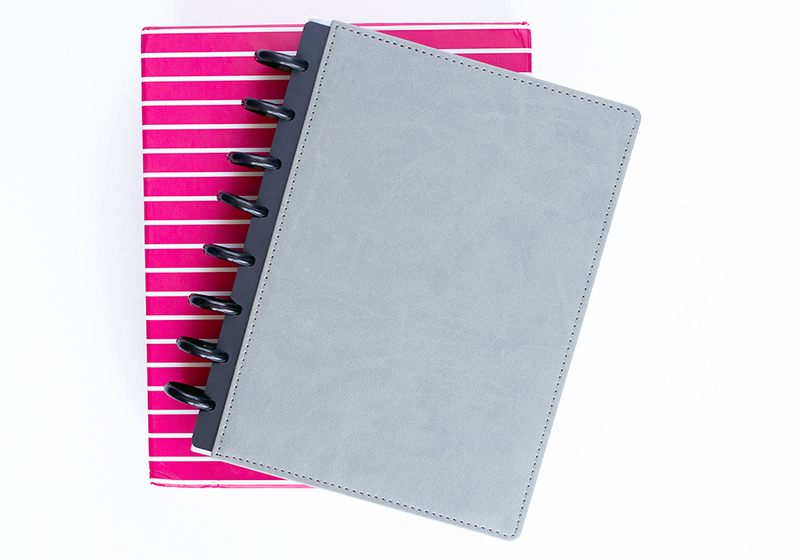 Since we use a disc binding system, you won’t put all those pages in your planner at once. 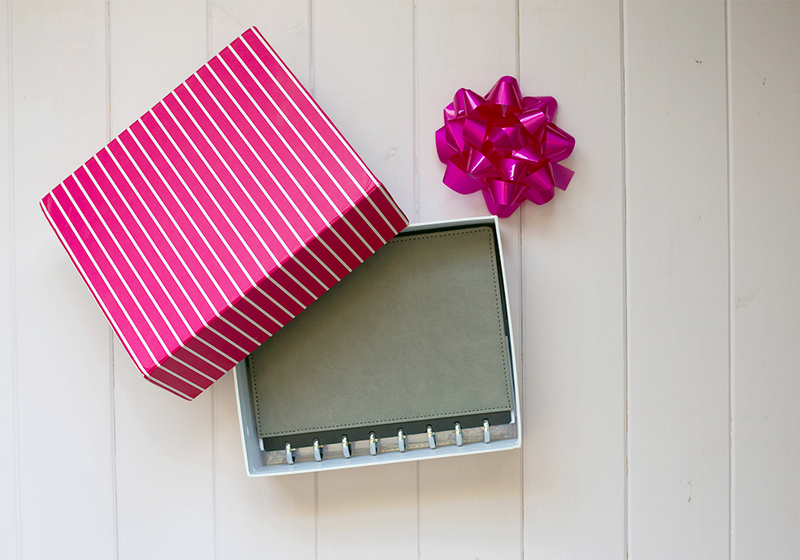 Every planner will arrive in a pink and white striped keepsake box. It’s the perfect place to keep all the extra pages that aren’t in your planner at any given moment. This year you also have the option of buying add-on packs to go with your planner including dot grid pages, lined note pages with cute illustrations in the corner, and a meal planning pack. Or you can purchase our blank pages that are cut and punched to fit in your planner and print anything you’d like on them. We kept the best part the same – the disc binding system! This allows you to add, rearrange, and remove pages to your heart’s content. Besides a couple small tweaks to the thickness of our discs to allow for even smoother gliding of the pages, we just left this part alone. And one more thing we didn’t change: we still use super thick, bright white paper. 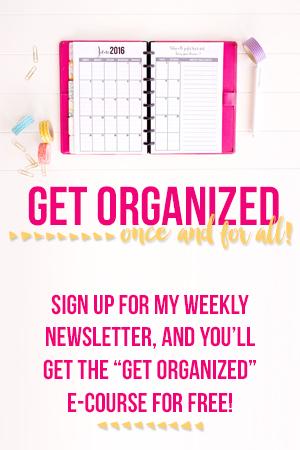 This custom planner will help you get organized and stay organized! 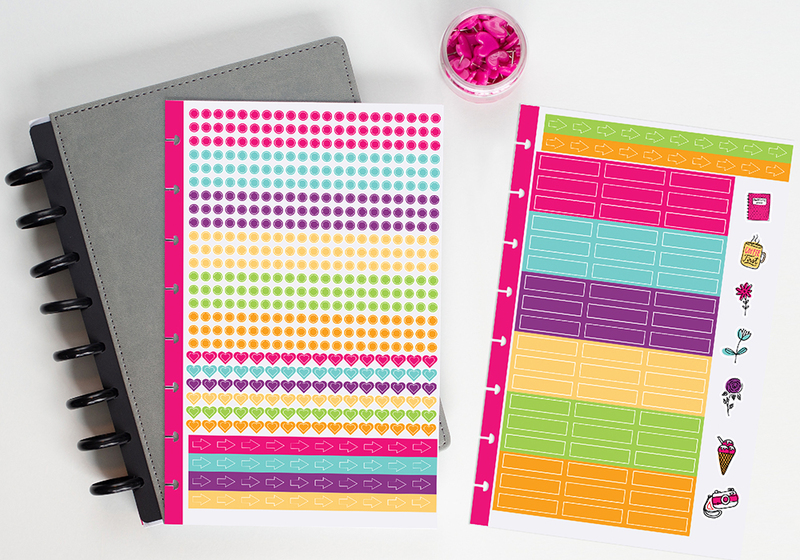 Click here to visit our shop and see all the cute planner and planner accessories available! Oh and don’t forget… if you pre-order the planner you can save $10 on your purchase. This is only available for a limited time, so make sure to check it out today! I hope you enjoy the planner just as much as we do! Happy shopping! « Student Planner: Learn how to customize your school planner! Could you please tell me what these pens are? What’s the manufacturer’s name? Thanks. Hi, you say the cover comes in two colors, but from what I can see on this post, you only show one. Could you please show us what the other cover looks like? Hi! I’m new to the club, but I’m enjoying all the printables. I have a Circa planner that I really like. I’m also able to do most of my own printing. Is there any way that I can buy the stickers, dividers, pouch, etc. without buying the whole planner? I don’t need the physical planner. I love the new 2019 planner! I already have the binder from last year. Can I get everything else? What is the cost? Hi, it’s only available as a complete planner. The cover is upgraded this year, so I think you’ll love it. I pre-ordered my planner in August. I can’t wait to get to plannin’! Can you tell me when they are expected to ship? They will ship by December 12. Hi. I was looking in the store and wondering… what is the BUJO Planner? Is that different from the weekly or daily version of the planner? I’m not familiar with that acronym. Thanks! 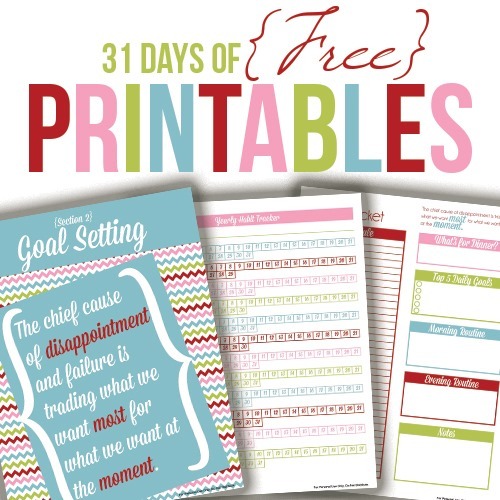 It’s the core planner WITHOUT any daily or weekly sheets. Instead it includes 100 dot grid pages. That way you have something to start with but can also make it your own, so it’s a hybrid planner and bullet journal. Do you only sell these planners through you? Is there anyway to see these in person first? I’m new to your planner so I want to be sure before I pay that amount. Are the disc plastic or metal? I have mt 2019 planner and love it! I am trying to be more organized and use it more. I am new to this for sure. Is there any boot camp or class that helps me learn how to use it and suggestions for the colour dots? I bought all the add ons..